There are times when individuals in Redlands area need to seek storage for their personal assets. Some customers may be in the process of staging their home or moving and need somewhere to put many of their personal belongings. Others may need extra storage that their home or apartment cannot meet. Many of our customers call us to store large personal items such as cars, boats, and recreational vehicles. No matter what your needs, we have a storage unit available for you. At Vines Storage, we have a wide variety of self-storage units available in a selection of convenient sizes. Individuals will find small storage units from 5' x 5' all the way up to 20' x 20'—comparable to the size of a two-car garage. Having a wide variety of self-storage units available to clients in Redlands area is a great way to help others in finding the space necessary to maintain the integrity of their belongings and investments. We have both indoor and outdoor options available for individuals who need to store large boats, RVs, and even boxes while in the moving process. Our facility also offers amenities that are not readily available at other facilities in the area, including 24 hour video surveillance and monitoring and easy, convenient access hours that work with any schedule. Our facility also offers flexible and convenient leasing options. Customers can enjoy month-to-month leasing as well as year-round, annual package options depending on their personal needs, desires, and budget. We work with individuals to make our storage units attainable and provide many perks and amenities that can help "seal the deal" for many potential customers. 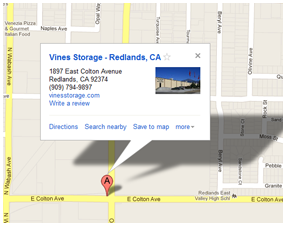 If you live in the Redlands community or surrounding areas and are looking for a location to store your belongings long-term or short-term, contact Vines Storage today to tour our facility and learn more about our self-storage units for large and small needs. We recommend individuals take the time to find out what makes our facility different from others and worth the investment in protecting what means the most to you!